Support is growing for a bill that would allow cultivation of industrial hemp in Virginia. It passed a house committee and is expected to go to a vote of the full house Thursday. WVTF-Radio IQ’s Robbie Harris has details. If the bill passes, it would bring back a crop was which was once required to be grown by Virginia farmers because of it’s numerous uses and ease of cultivation. 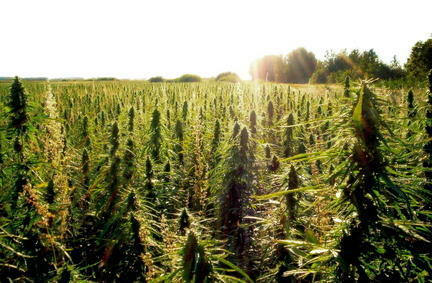 But in the 1930s, growing hemp was outlawed by the federal government. Some say, because of confusion about its relationship to it’s more potent cousin, the marijuana plant, and other says because fossil fuel companies didn’t want to face competition from hemp oil. Jim Politus is a former farmer and member of the Montgomery County Board of Supervisors. He became an advocate for industrial hemp in Virginia as a way to help small farms stay in business and boost the state economy. He spoke to us by cell phone on his way back from Richmond after he spoke before the Agriculture Committee in support of the bill. “When you compare hemp to cotton you have about 2 and a-half times the yield, half the water needs, no pesticides, so that will help areas like Danville,” he said. The bill to legalize growing industrial hemp in Virginia is sponsored by Pearisburg delegate Joseph Yost. If it becomes law in the spring session, it would begin with research by State Universities such as Virginia Tech and Virginia State University. And if the federal government allows it, crops could be in the ground by 2016.